Southern California's best surfing season tends to be during the winter months: December, January, and February. Bookending those months, November, March, and April, you can also expect to find some decent swell. Check out the 15 top surf spots in Los Angeles based on your surfer level and what to expect there. El Porto Beach is a tried-and-true beginners surf spot in El Segundo. In the winter months, there is some decent swell, which is great for intermediate level surfers. If you go to Manhattan Beach at 26th Street, expect to find all levels of surfers at the sandy bottom surf spot. It is known to be particularly attractive for advanced wave riders. To reach this world-class rock and sand bottom spot, located at the south end of San Clemente Island, you must get there by boat. If you plan to go there, advanced knowledge of surfing is recommended. Santa Monica State Beach, also called Samo 20, is a centrally located surf spot where frequent waves hit, and most of the surf here comes from groundswells. This beach is popular for beginners at any time of the year. Waves at the beach break both left and right—but be warned that the beach can sometimes get very crowded as it is the most convenient to reach from the central Los Angeles area. Lunada Bay is a world-class rocky reef surf spot most suitable for advanced riders. The horseshoe-shaped bay is found on the western end of Palos Verdes Estates. Heavens Beach is a sandy-bottom surf spot with waves that work for all levels of surfers. To get there, take the Pacific Coast Highway to Leo Carrillo State Beach. Right next to Heavens is Staircase Beach, another favorite spot. It earned its name because you take a staircase down to the beach from the parking lot. Sunset Beach is a regional classic drawing all levels of surfers. The terrain is sandy with coral and some sharp rocks. To get there, take Sunset Boulevard going west until the road ends at the ocean. At Leo Carrillo State Beach, you can find good standard surfing in a zone of flat rocks with sand. The beach is an excellent place to go for surfers of all levels. It is also a trendy locale for windsurfing and surf fishing. 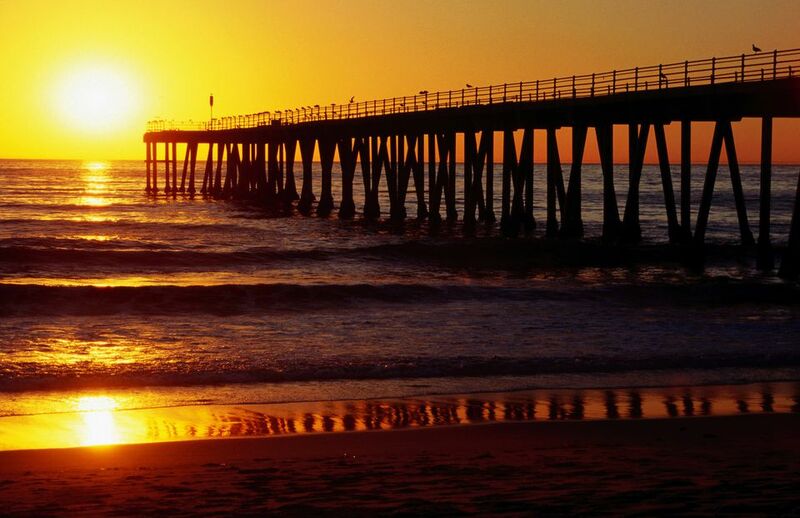 Hermosa Beach has a sandy bottom and is good for most levels of surfers. Also, it tends to attract some advanced wave riders. The pier is a lure for tourists, so surfers should expect an audience. TCs in San Pedro is a grade-A surfing spot accessible from the 110 Freeway. The rocky reef is geared toward experienced wave riders. Summer typically offers the best conditions. Like Santa Monica, Venice Beach is a centrally located surf spot that appeals to wave riders of all levels. The beach will be crowded with tourists and the water filled with local riders. Regular waves grace Zeros. This water is best left for experienced surfers. The surf is frequent, and the bottom contains coral and some sharp rocks. You can find Zeroes at Nicholas Canyon Beach, not far from Leo Carrillo State Beach. There is heated debate about the level of skill needed to surf at Zuma Beach. Some claim that it's a good place for beginners. Others disagree since the waves tend to be short and quick, giving it a slightly higher intermediate ranking.